The opening chapter, Soup Basics, provides a solid overview of everything a cook needs to know about creating soups and stews, from how to select and prepare ingredients to choosing the right pots and pans, and a multi-page chart clarifies amounts needed when shopping for various ingredients. Recipes come from a tasty variety of culinary traditions, divided into chapters on Broths, Hearty Soups, Stews, Cream Soups, Puréed Soups, Bisques and Chowders, and Cold Soups. Each chapter has its own overview of technique. For instance, the chapter on Stews discusses how to choose ingredients; properly flavor and season a stew; basic stewing methods; and more. An unexpected chapter on Accompaniments--e.g., Rye Rusks, Gougères, Vegetable Chips, Popovers--contains recipes for extras to enhance any soup you create. 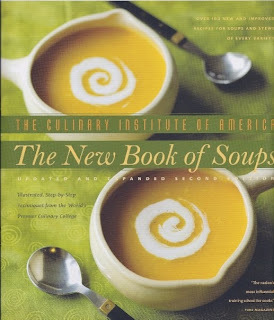 All in all, The New Book of Soups is a worthy addition to your culinary bookshelves. The cuisine of Spain is rapidly becoming more familiar to cooks and restaurant-goers. This dish marries a flavorful cut of beef from the shoulder with some typical Catalonian ingredients: oranges, olives, red wine, and bacon. Bitter oranges are traditional, but if you don't have access to a bitter orange, use a Valencia (juice) orange and a touch of lime juice for nearly the same flavor profile. Add the bacon to a casserole dish or pan and sauté until the bacon is crisped and browned, 5 minutes. Transfer the bacon to a bowl with a slotted spoon, letting the oil drain back into the casserole. Return the beef and bacon to the casserole, add the red wine, orange peel, bay leaves, garlic, and parsley; bring the liquid to a boil. Immediately adjust the heat for a gentle simmer. 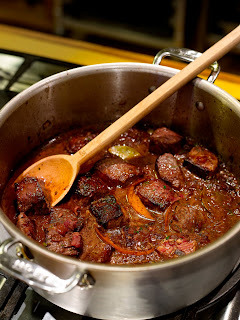 Season the stew to taste with salt and pepper throughout cooking time. Simmer the stew, covered, until the beef is nearly tender, about 2 hours. Add the olives and continue to simmer until the beef is fork tender, 1 to 1 1/2 hours. Serve in heated bowls.